Two months after joining the Ply Gem Building Products business by way of a nine-figure deal, Denver-based precast concrete veneer producer Environmental StoneWorks will be among Cornerstone Building Brands. The latter spans the exterior products businesses of NCI Building Systems and Ply Gem, which merged in 2018, and is set to trade on the New York Stock Exchange under the ticker symbol “CNR” pending shareholder approval next month. 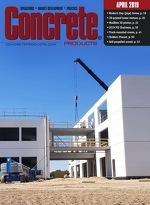 The Texas Aggregates & Concrete Association has launched a campaign to build awareness of the aggregates, concrete, cement and associated industries, while spotlighting employees who make production and delivery possible. #WeRTexas factors population growth of approximately 1,400 people per day and these material figures 10 years out, as measured against present annual shipment levels: 15 million to 50 million more tons of aggregate; 3 million to 10 million more yards of ready mixed; and, 1 million to 3 million more tons of cement. Former Martin Marietta Materials Chief Financial Officer Anne Lloyd, who retired from the aggregates and ready mixed concrete giant in 2017, has joined the board of welded wire reinforcement and prestressing strand specialist Insteel Industries. The proprietor of the wireless, slab-embedded SmartRock sensor is extending its temperature and maturity monitoring capabilities with Roxi, a platform applying artificial intelligence methods to concrete quality control. Giatec Scientific developed the platform in conjunction with Mila, a McGill University- and University of Montreal-hosted lab, and announced the effort at the 2019 bauma trade fair in Munich.